A delicate and fragrant white tea with fruit undertones, grown on our award winning tea farm on Tai Mu Mountain. 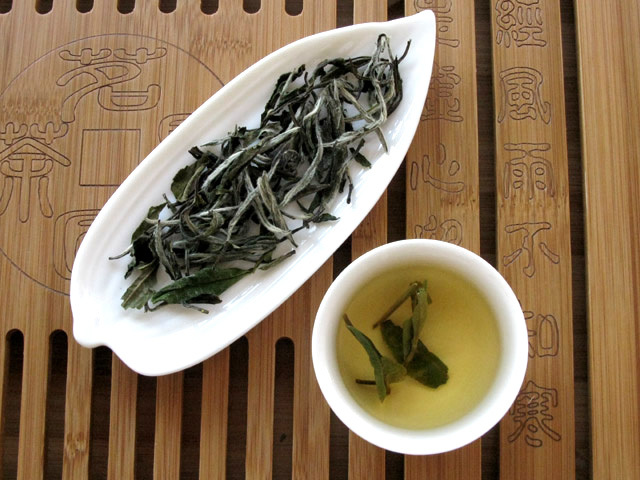 Won the 2007 Gold Prize in Fujian Province’s White Tea Contest, making it the #1 White Peony in the region. I’ve tasted quite a few White Peony teas over the years. And before I had developed a liking and an appreciative palate for White teas, I had falsely assumed that all White Peony teas are the same. But, they aren’t! This is one of the best White Peony teas that I’ve ever encountered. The flavor is amazing! While most white teas tend to be on the delicate side, I am finding this white tea to be amazingly flavorful! While this is quite a bit more delicate than say, a black tea, it is extraordinarily flavorful when taking into consideration that this is a White Peony. This tea is sweet and even has a creamy quality to it that is rather delightful. The mouthfeel is really soft and smooth. This texture reminds me of the sensation that a green Oolong might impart onto the palate, although it doesn’t linger quite as long as an Oolong. There is a fresh, crisp taste to the tea that is vaguely reminiscent of a crunchy green apple. Truly among the finest White Peony Teas available anywhere, this is one that I highly recommend to any tea afficionado! Even for those tea lovers who think they do not care for white teas – I do believe that this one just might change your mind! It is a MUST TRY!